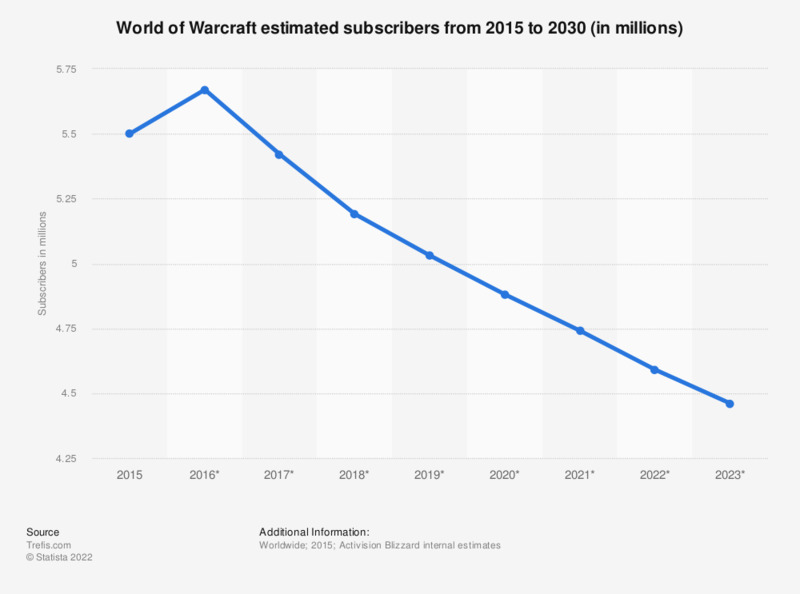 This statistic shows the estimated number of subscribers of the MMORPG World of Warcraft online game from 2015 to 2016, with a forecast until 2023. In 2015, when Activision Blizzard last reported on WoW's subscriptions, the game had 5.5 million global subscribers. It is projected that the numbers will be gradually decreasing to reach 4.46 million in 2023. World of Warcraft reached the peak of its popularity in the second half of 2010, when Activision Blizzard’s estimates put the global number of WoW subscribers at 12 million. Before that, the number had been climbing steadily from 1.5 million in the first quarter of 2005, exceeding five million in the fourth quarter of 2006 and 10 million in the fourth quarter of 2007. In 2011, the figures started falling and by the first quarter of 2014, they decreased to the 2006 level. World of Warcraft is the fourth in the series of games published by Blizzard Entertainment, after “Orcs & Humans,” “Tides of Darkness,” and “The Frozen Throne.” It was released in late November 2004; the date was not arbitrary – the release celebrated the 10th anniversary of the whole franchise. As of August 2016, six expansions to the game had been released, with the fifth – “Warlords of Draenor” – having appeared on the market in fall 2014. Within the first day of its release, the expansion pack sold 3.3 million copies, as did the sixth expansion - Legion. The main appeal of the series is the possibility for players to transform into many different creatures, so called races, yet most choose to be human. In 2012, WoW publisher Activision Blizzard was the most successful video games publisher in Europe and the United States, holding nearly 20 percent of the market. The company’s 2013 annual revenue amounted to 4.48 billion U.S. dollars, out of which more than one billion constitutes the company’s net income. The company has also created such games as Call of Duty, Guitar Hero, and StarCraft. As of the last quarter of 2015 Activision Blizzard stopped reporting on the number of WoW subscribers. Therefore the figures shown are estimates and forecasts. Actuals reported before this period can be accessed in a downloadable Excel file.